According to the World Health Organization, approximately 180,000 deaths every year are caused by burns, with the majority occurring in low- and middle-income countries. Upon arriving at the emergency room with a burn, the patient undergoes a clinical inspection to assess both the severity of the lesion in relation to the affected area of the body and the depth of the injury (1st, 2nd or 3rd-degree burns). Based on this assessment and other considerations including bleeding and the extent of the damage, the surgical team makes a decision regarding management of the patient's care. To address this issue, researchers at McGill University's Faculty of Medicine, working in collaboration with Universidad Autonoma de San Luis Potosi in Mexico, propose using non-invasive digital infrared thermography within the first three days of a patient suffering a burn in order to better predict the best mode of treatment. Their method is described in a paper published last fall in PLOS ONE. Akin to taking a picture using a special camera, the method is painless, quick to acquire and requires minimal training. 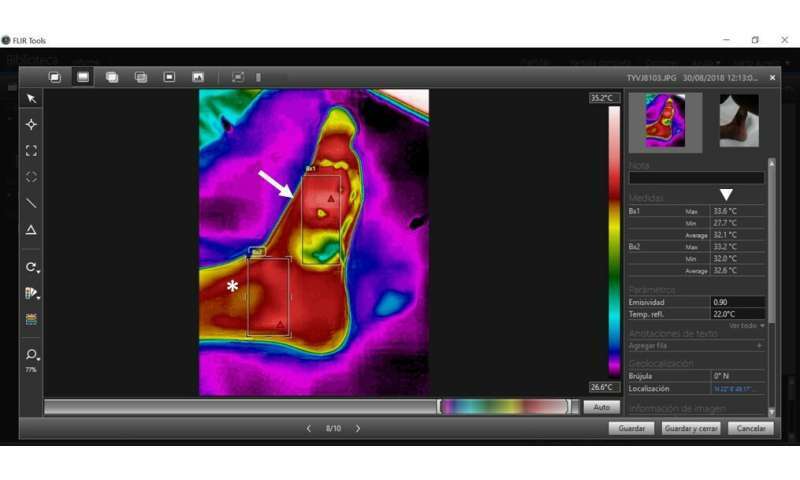 "Digital infrared thermography allows us to visualize the heat emitted by objects," explains Dr. José Luis Ramírez García Luna, Ph.D. candidate in the Department of Experimental Surgery at McGill and the paper's corresponding author. "In the human body, heat emission depends on blood flow to the tissues, thus it is an indirect measurement of blood perfusion to the skin or a wound bed. Previous research has shown that the temperature of the skin correlates well with blood flow to it and that there are differences in the temperature pattern of healing vs. non-healing wounds." "We believe our method could become a useful tool for the early assessment of patients in the emergency department, as well as in the later stages of patient care to identify dead tissue, distinguish between partial and full-thickness burns and detect complications such as the presence of infection or lack of blood flow," notes Dr. Ramírez García Luna. "In our opinion, the most relevant contribution of our method to wound care is in allowing the clinical team to rapidly and objectively determine the treatment modality that is most likely needed, thereby preventing unnecessary procedures or delays in surgery. Because this has implications in selecting which patients may benefit more from certain interventions, and which will not, it is very likely that it can be translated to lowering costs related to treatment and hospital stay, as well as in reducing the length of hospital stay for the patients."